It's April and we're still experiencing winter temps - when is spring weather ever going to arrive?! I recently picked up a whole chicken fryer with the idea of roasting it with some fancy seasonings, but instead I kept it simple. Sometimes a solid classic meal does the body good and given the weather, something comforting was what we were all longing for dinner. I made this Classic Roast Chicken that's rubbed with a compound butter made with fresh garlic, thyme, paprika, coriander, salt, pepper and stuffed with lemon, shallots, and thyme. Fragrant, flavorful and simple... what ever dinner should be like! 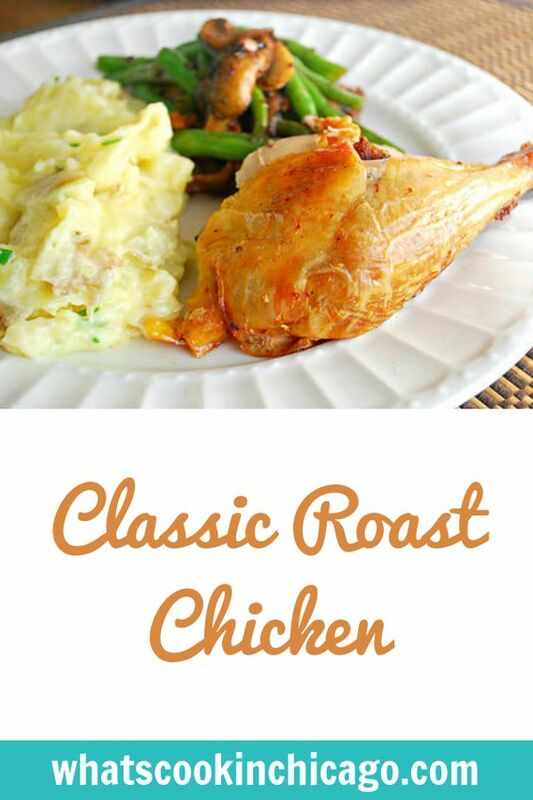 This is such a classic preparation for a roast chicken and can also be done for pork tenderloin. The best part of this recipe is the compound butter. 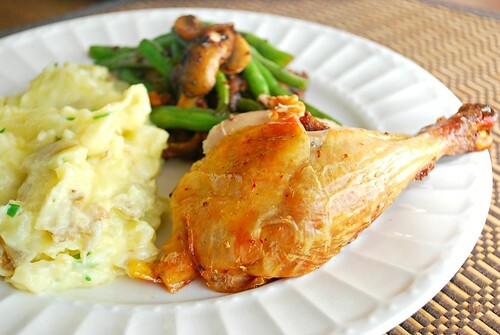 It makes for such a flavorful and moist chicken as it slowly roasts in the oven. You can also make extra compound butter to use in other recipes to impart flavor in rice, potatoes, corn and your favorite vegetable for a number of side dishes! Discard giblets and neck from chicken. Starting at neck cavity, loosen skin from breasts and drumsticks by inserting fingers, gently pushing between skin and meat. Combine butter and next 7 ingredients (through garlic) in a small bowl. Rub mixture under loosened skin, over flesh; rub over top of skin. Tie ends of legs together with twine. Lift wing tips up and over back; tuck under chicken. Place chicken, breast side up, on a rack; place rack in roasting pan. Place shallots, thyme sprigs, and lemon in cavity of chicken. Bake at 350° for 45 minutes. Increase oven temperature to 450° (do not remove chicken); bake at 450° for 15 minutes or until a thermometer inserted in meaty part of leg registers 165°. Remove chicken from pan; let stand 10 minutes. Discard skin. Carve chicken.